PHOENIX, Ariz. (September 12 , 2010)– The Greater Phoenix Convention & Visitors Bureau (GPCVB) has been awarded the prestigious Meetings & Conventions’ 2010 Gold Service Award by M& C’s subscribers. This award honors Convention & Visitors Bureaus (CVBs) that have excelled in professionalism and dedication in their service to meeting professionals. 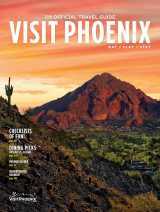 Meeting planners vote for the top convention and visitors bureaus throughout the world and have selected the Greater Phoenix Convention & Visitors Bureau as one of the greatest. Relying on their extensive industry experience in both corporate and association markets, M&C’s readers make selections based on key criteria including: professionalism of staff; support on hotels and site inspections; assistance with ground transportation planning; guidance on local attractions; and liaison with local venders and services. GPCVB will be featured in Meetings & Conventions’ Gold Awards issue published this November.